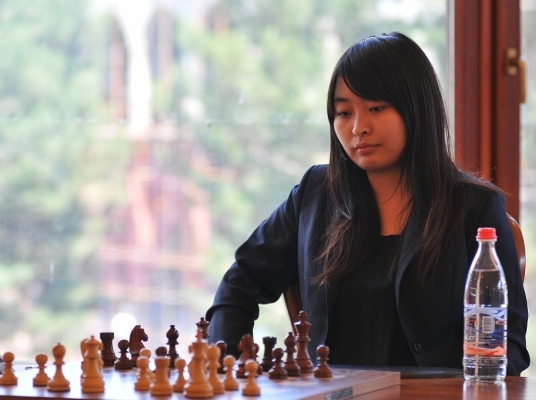 Earlier, in the fifth round, Hou Yifan beat Khurtsidze and Nadezhda Kosintseva lost to Lilit Mkrtchian. The other games were all draws: Ruan Lufei-Koneru Humpy, Kovalevskaya-Ju Wenjun and Lahno-Munguntuul. 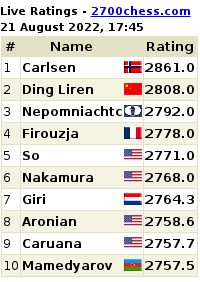 Here are the standings after six rounds as the girls go into the first rest day on Monday. 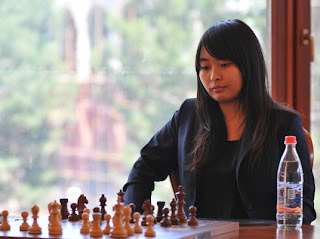 Ju Wenjun has 4.5 points, Hou Yifan, Koneru Humpy and Ruan Lufei at 4.0 points, Elina Danielian, Kateryna Lahno, Lilit Mkrtchian, Zhao Xue are at 3.5 points each, Ekaterina Kovalevskaya and Nadezhda Kosintseva at 2.5 points each, Batkhuyag Munguntuul at 2.0 and Nino Khurtsidze.